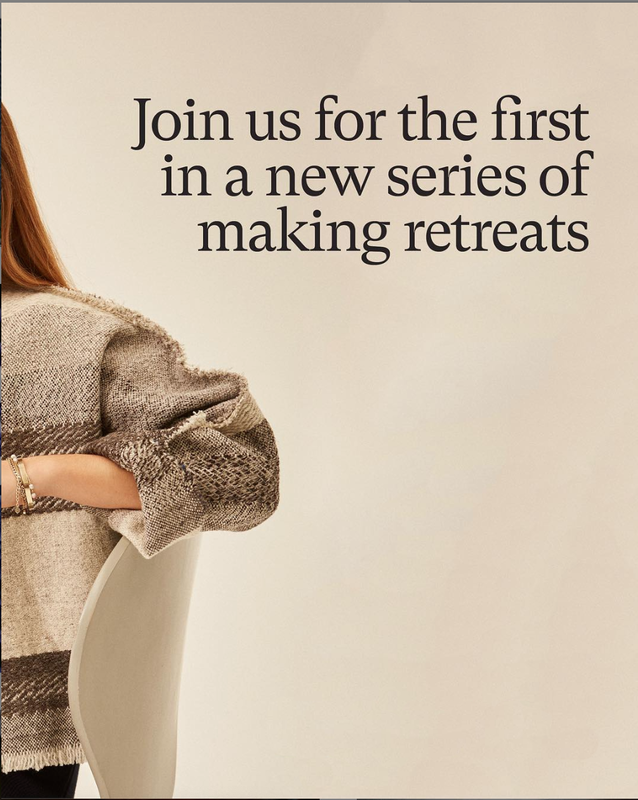 I am excited to announce, and invite you to join us for the first in a new series of Hole & Corner making retreats based in Dorset at the home of Sam Walton, the founder and creative vision behind the magazine. At Home with Hole & Corner will create a platform to pair with one of our favourite makers, with the aim to deliver a personal and fulfilling experience in a truly special setting. 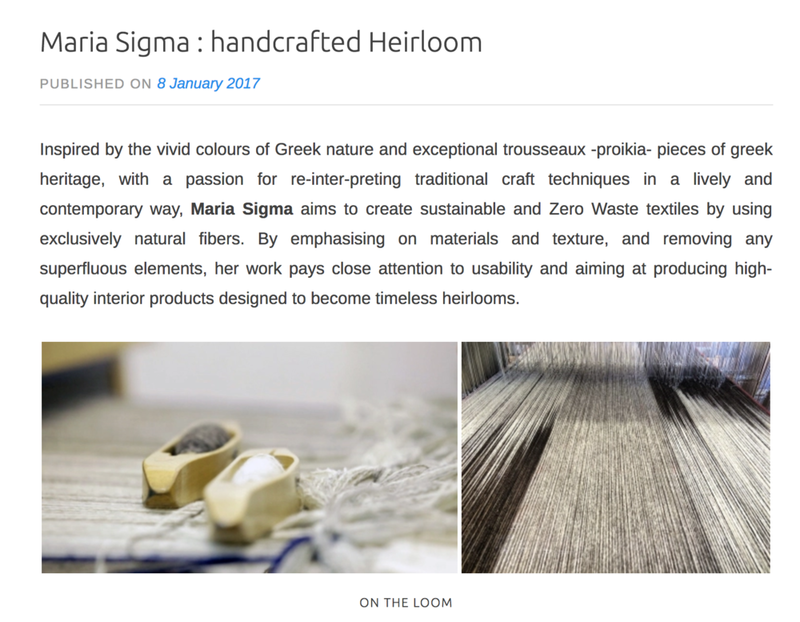 For the first instalment we are delighted to partner with Maria Sigma , the award winning textile designer who specialises in luxurious hand-woven products with a zero-waste ethos. The event will take place over two days (Thursday 21st & Friday 22nd March) and include lunch alongside a full day of learning and making, with everyone very welcome to join for either one or both days. 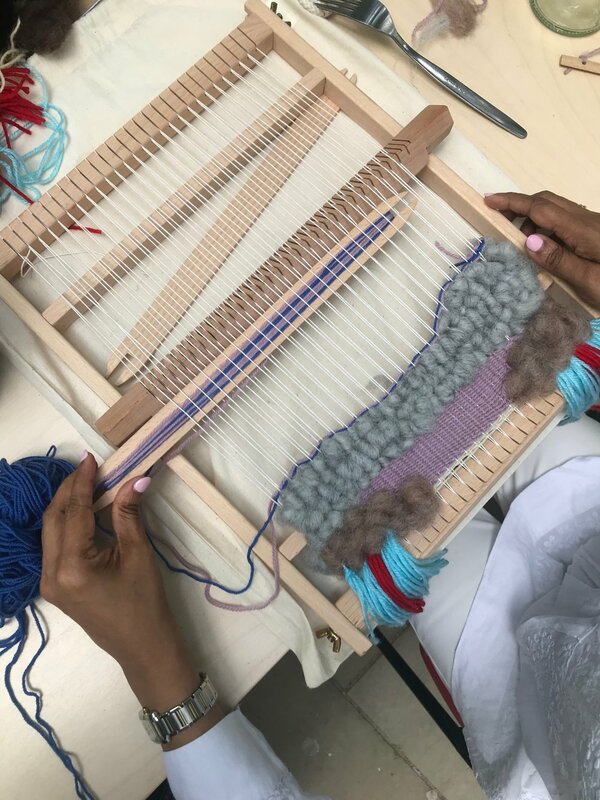 The workshops will be focussed on the craft of hand-weaving with frame looms, and will provide the opportunity for everyone to learn foundational weaving skills. Not just about specific skills, the aim is to guide and encourage each student to establish their own style and approach to colour, techniques and materials, whilst creating their own hand woven textile that can be further developed and used however you choose beyond the event – let your imagination take you! The event will be capped at 8 people per day to ensure that everyone receives a full experience of working and learning, and will take place on Thursday 21st and Friday 22nd March (10am-6pm). The event day will also include a visit from local producers and artisans, as well as an optional walk in the local Dorset countryside. 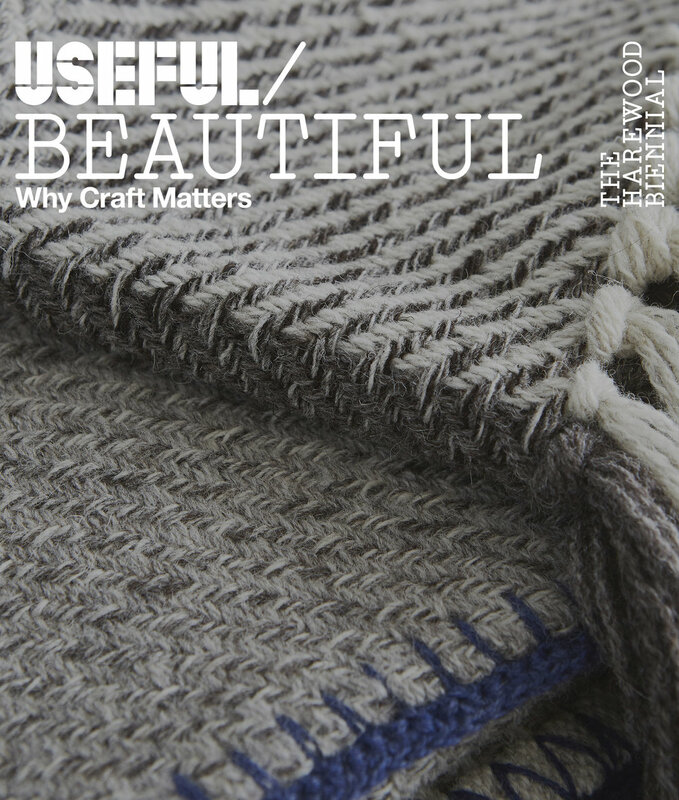 Useful/Beautiful : Why Craft Matters? The exhibition Useful/Beautiful: Why Craft Matters, aims to challenge preconceptions, spark interest and inspire debate about the role craft can play in culture, identity and society. Curator, Hugo Macdonald, introduces the first Harewood Biennial. For the inaugural exhibition, we have brought together 26 individuals, workshops and brands that practise a craft. They are exhibited in different rooms on the State Floor and Below Stairs, each relating in some way to their particular location: paper in the Main Library, pans in the Old Kitchens and garden tools in the Garden Room. Some techniques, like book-binding, basket and textile-weaving, have hardly changed for millennia. Some have evolved, incorporating technology to explore new possibilities of process, form and function. From jeans to pocket knives to reclaimed furniture to glass sculptures, every exhibitor has a story to tell. This is why we have asked each craftsperson to respond to the statement: why craft matters, to them and today. The title of the exhibition is derived from the quote by William Morris, pioneer of the 19th century Arts & Crafts movement. Morris believed social values were under threat from the industrialisation of life. Just over a century later, we are entering the age of automation and artificial intelligence. In these times of great change craft is not only something to rescue from the past, it is a powerful human process that can help us shape our future, too. Join Useful/Beautiful artist Maria Sigma for an in depth workshop which will teach you all the basics of weaving and how to turn your household waste textiles from old T-shirts to pillowcases into textile masterpieces. The workshop will provide you with a thorough and intensive grounding in hand-weaving. You will learn foundational weaving skills, such as warping, loom set up, colour blending and structure, and basic weaving techniques and patterns. Not only will you cover a wide range of styles but also learn how to develop your own distinctive voice as a weaver. You can make a small wall hanging, pieces for a patchwork, a clutch bag or an abstract artwork, and plenty more. Let your imagination run wild! A small wooden frame loom, weaving tools and instructions booklet will be provided in a recycled-cotton pouch to take home. Materials and yarns will be also provided, but do bring your own textiles to recycle – tablecloths, bed sheets, pillowcases and T-shirts. Refreshments and a sandwich lunch are included with this workshop. Please notify us of any dietary requirements you may have. Please make your way to the Information Point at the top of the carpark on arrival at 11am, where a member of the Harewood Team will be there to meet you. Please remember to bring your own recycled textiles with you to use throughout the workshop. In 2010 Maria decided to come to London and do a second degree in Textile Design, specialising in handweaving at Chelsea College. During her degree in London and after having the basic knowledge of how to use a dobby loom and basic weave structures, she discovered how much more she enjoyed playing with texture. It magically made sense why she was using her fingers to draw instead of a brush – it was all about texture! She gradually started removing colour and focusing on texture. Not only because it is much more sustainable to use undyed yarns and matches with her ‘zero waste’ philosophy, but also because it was challenging to aim to make something beautiful with totally different rules. With a lack of colour. Or, at least, what she thought colour was all about, until then. Her vision is to have a sustainable creative craft-based business. In the next two years she aspires setting up her own weaving studio/showroom and space for workshops. Her goal is to sell one-off pieces through small high-end boutique shops and galleries, and collaborate with interior design studios for bespoke commissioned work. Among her plans is to collaborate with furniture makers and create together a series of upholstered hand-made furniture. Maria Sigma | Woven Textiles will take part with selected work for only a week at the next pop-up of The Maiyet Collective in Knightsbridge's iconic Harvey Nichols Store - CANVAS Room at 5th Floor. During the pop-up MS will also host a special Frame Weaving Workshop From Waste in partnership with Fashion Open Studio..
An in depth workshop which will teach you all the basics of weaving and how to turn your household waste textiles from old T-shirts, knitwear to pillowcases and tablecloths into textile masterpieces. 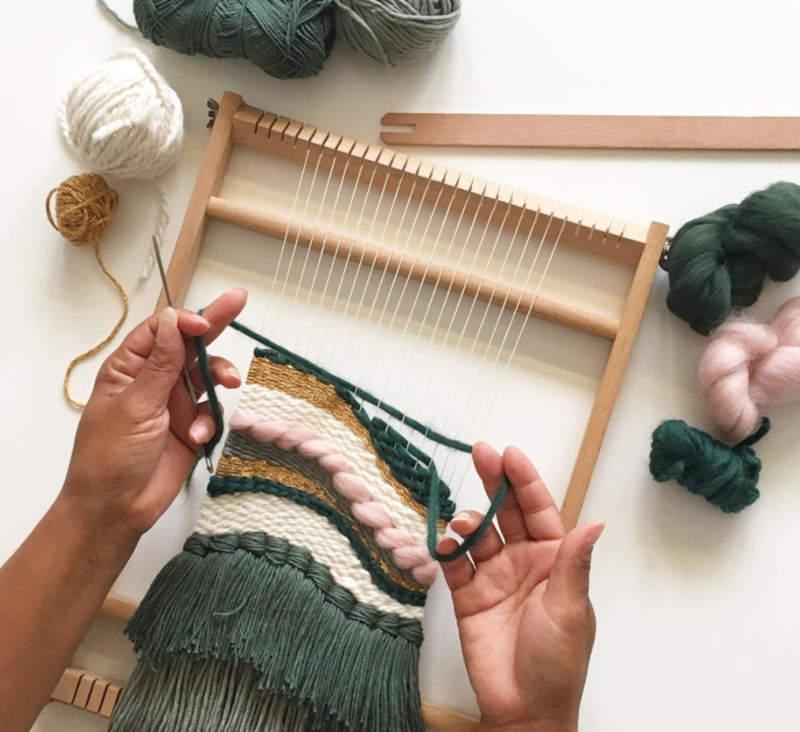 The price for this 4-hour workshop includes refreshments, a kit with your own loom and everything you need to start you on your weaving journey. Yarns will be supplied but do bring your own textiles to recycle - tablecloths, bed sheets, pillow cases, knitwear and T-shirts. The Maiyet Collective is based on the founding principle that brands do better in collaboration. Bringing together an evolving curation of over 50 positive impact luxury brands on a rotational basis, our unique pop-up store with stunning interior designed by The New Craftsmen provides a showcase and community for like-minded brands and consumers alike who share our philosophy and mission. In partnership with Fashion Revolution, the aim is to educate, inspire and create a community of people who are committed to changing the way we think, create and consume fashion. 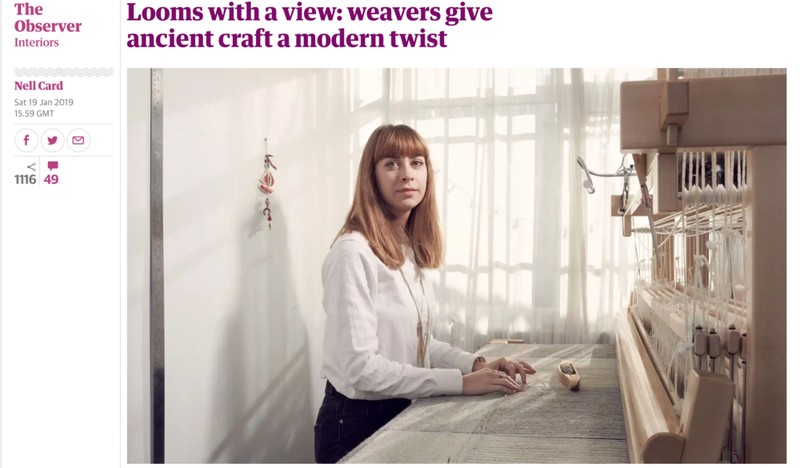 ‘I would say the most fundamental element in my work is the zero-waste philosophy and the use of natural materials,’ says weaver and textile designer Maria Sigma, who creates pieces for interiors and fashion from her London home studio using un-dyed or naturally dyed organic fibres. Small in scale, London's modern weavers want you to explore handmade products in an era of mass-production. I am delighted to announce that I am one of the seven makers exhibiting at the first exhibition of MAKE, the new gallery space of Hauser & Wirth Somerset, dedicated to contemporary making and crafted objects. I am showcasing a collection of three new very special and one of a kind wall hangings. One of a kind piece made with two woollen warps and a linen/jute/cotton weft, in plain weave creating a tube format and following the ‘zero waste’ philoshophy. Hestia (/ˈhɛstiə/; Greek: Ἑστία) is an ancient Greek virgin goddess of the hearth, fireside, architecture, and the right ordering of domesticity, the family, the home. Hestia's name means "hearth, fireplace, altar”, stemming from the same root as the English verbal form was (PIE*h2wes- "to live, dwell, pass the night"). It thus refers to the oikos, the household, house, or family. One of a kind piece made with a woollen warp and a linen/cotton/wool weft in a textured lace-style distorted diamond, following the ‘zero waste’ philosophy. Ariadne (/ˌæriˈædni/; Greek: Ἀριάδνη; Latin: Ariadne) is an ancient Greek Mythology heroine, daughter of Pasiphaë and the Cretan king Minos. As per Homer's Odyssey, she felt in love with the Athenian hero Theseus and, with a thread or glittering jewels, helped him escape the Labyrinth after he slew the Minotaur, a beast half bull and half man that Minos kept in the Labyrinth. 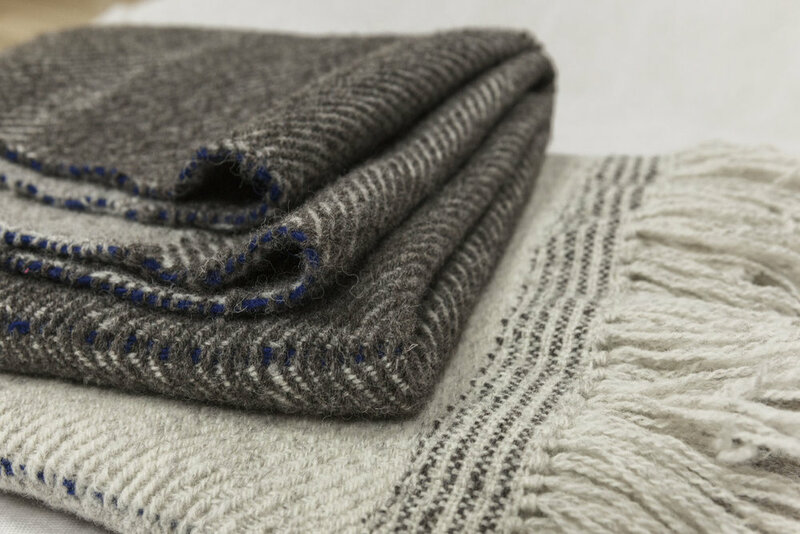 One of a kind piece made with a woollen warp and weft in a textured ‘broken’ twill, following the ‘zero waste’ philosophy. Alcyone (/ælˈsaɪəˌni/; Ancient Greek: Ἁλκυόνη, Halkyónē ), designated Eta Tauri, is a multiple star system in the constellation of Taurus. The name Alcyone originates with Greek mythology; Alcyone (derived from alkyon αλκυων “kingfisher") in Greek mythology, was the name of one of the Pleiades or Seven Sisters. When her husband died in a shipwreck, Alcyone threw herself into the sea whereupon the gods transformed them both into halcyon birds (kingfishers). When Alcyone made her nest on the beach, waves threatened to destroy it. Aeolus restrained his winds and kept them calm during seven days in each year, so she could lay her eggs. These became known as the "halcyon days," when storms do not occur. Today, the term is used to denote a past period that is being remembered for being happy and/or successful. Make’s inaugural exhibition entitled ‘Opening Narratives’ is a celebration of seven makers working with wood, ceramics, textiles and metal. With the resurgence of interest in craft skills, the landscape of making is changing and with it a dynamic generation of young makers with a shared passion for knowledge, process and materials has come to the fore. The makers exhibited possess an intimate understanding of their material and whether working with methods rooted in tradition or employing new techniques, materiality and process go hand-in-hand. The exhibition reflects the new visibility and significance of making and the re-evaluation of the crafted object, whilst bringing together seven makers with work of exceptional creativity and substance. For orders please contact the studio. In 2017 the British Craft Pavilion brought 36 makers from around the UK to the heart of East London in the Old Truman Brewery. Working in partnership with Hole & Corner we gave the 36 makers a platform to exhibit their work to over 28,000 international visitors. For 2018 the British Craft Pavilion returns with an exciting new project on an even larger scale. Partnering with Hole and Corner, 40 makers will be selected to take part in an outstanding display of British craftsmanship. Using exceptional natural materials, London-based designer Maria Sigma creates contemporary textiles that celebrate long-established traditional craft techniques. Working with raw natural materials, with a focus on texture and tactility Maria creates handcrafted timeless heirloom that speak to both her Greek heritage and her fascination with the British landscape. Ariadne (of the Sea), Xenodice and Phaedra V2 Throws on the Good Design Greece Exhibition 2018 at EMST National Museum of Contemporary Art, Athens. Conceived in association with dunhill, the Home of Craftsmanship saw Bourdon House – their magnificent 18th century Mayfair flagship store – transformed into a creative hub for London Craft Week. 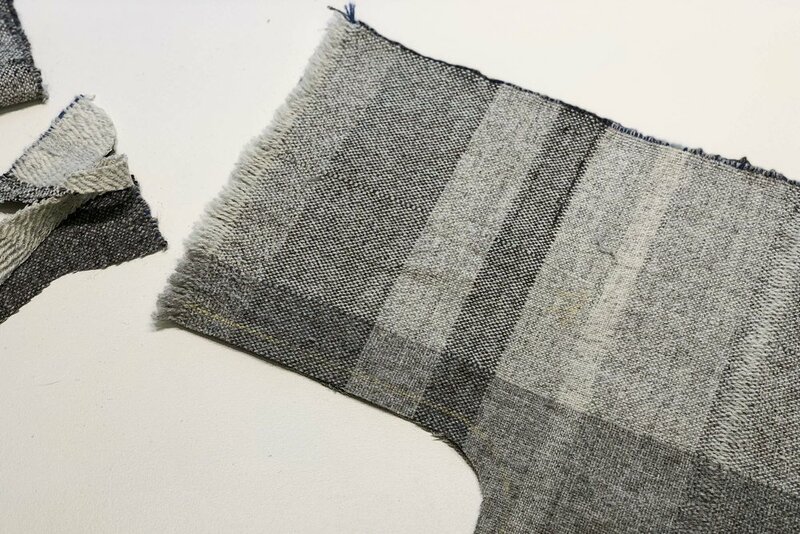 But perhaps best of all were the impromptu collaborations: Maria Sigma invited one of dunhill’s master tailors, Joseph Butler, to turn the weave she had been working on all week into a bespoke jacket. ALCYONE (OF THE SKY) JACKET: one-of-a-kind piece made with a handwoven cloth with natural undyed British wool in an improvised style without following a pattern. Hand-stitched in a Kimono-inspired shape by respecting and following the natural elements of the cloth and emphasing into its raw state. FIND OUT MORE HERE. Hole and Corner collaborated with Dunhill this year, taking over their Mayfair flagship store at Bourdon House. Curating the ‘Home of Craftsmanship’, the store was filled with live demonstrations from various artisans: glassblowing with Michael Ruh, pottery with Florian Gabsby, weaving with Maria Sigma, spoon carving with Mark Reddy, knife making with Pole and Hunt and leather tailoring with the Dunhill team themselves. It was an innovative way to showcase an array of crafts and connect personally with the makers. 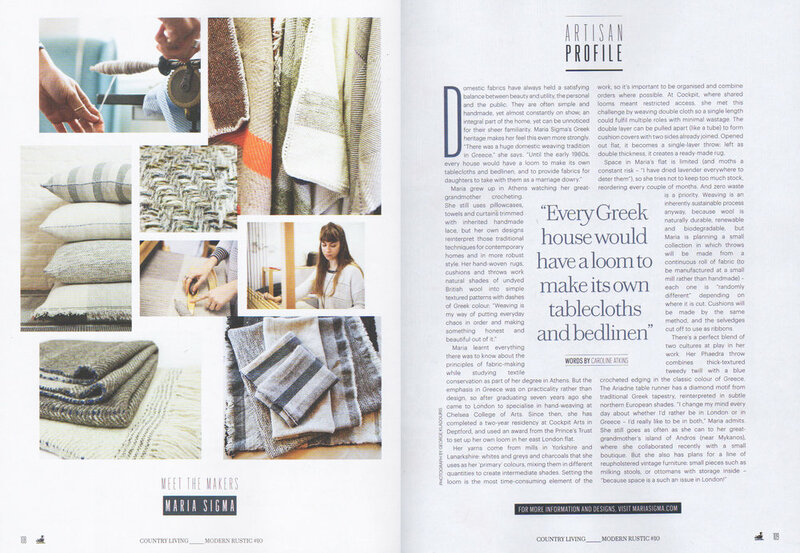 For London Craft Week, weaver Maria Sigma moves her enormous loom from her home studio into The Home of Craftsmanship. While she demonstrates her work in a new environment, we caught up with Sigma about the delicate art of working from home. Hole & Corner and dunhill are collaborating to produce The Home of Craftsmanship – an inspirational creative hub at the centre of the 2018 edition of London Craft Week. From Thursday 10th to Saturday 12th May, Bourdon House, dunhill’s flagship townhouse store will open its doors to all and Hole & Corner will curate a series of live demonstrations, installations workshops and discussions. Each room within the home will be transformed to offer the visitors a unique opportunity to witness the work and skill of some of the UK’s most respected makers. A set of workshops will also allow guests to learn spoon-carving and leatherworking – just be sure to book your place in advance! Makers-in-residence over the week will include glass artist Michael Ruh and ironworker Alex Pole, both demonstrating their craft in the courtyard; renowned ceramicist Florian Gadsby throwing in the Rotunda Room; wood sculptor Mark Reddy carving spoons on the Lower Ground floor; textile weaver Maria Sigma working live on a loom in the Tailor Room; and two dunhill master-craftsmen in leather and tailoring from the Walthamstow Factory and Bourdon House in the Mahogany Room. Hole & Corner will also present a programme of talks and conversations around the subject of ‘Home’. These discussions will include renowned perfumer Lyn Harris talking with the talented interior designer Ilse Crawford, and the innovative architect Jonathan Tuckey in conversation with Matt Gibberd and Albert Hill, co-founders of pioneering estate agency The Modern House. On the lower floor of the home, there will be a selection of films, shown in dunhill’s private cinema, further exploring the themes of craftsmanship, art and design. A dedicated café space will also be open for visitors to sit down, unwind, and feel at home whilst leafing through a curated selection of books and magazines – the epitome of a hole-and-corner in the centre of London Craft Week. London Craft Week 2018 will run from 10th to 12th of May. Find the full programme here. 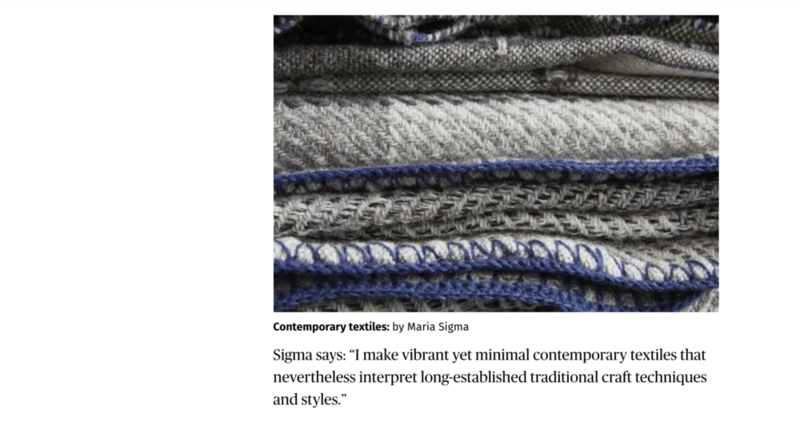 I am very happy to announce that MARIA SIGMA | WOVEN TEXTILES has officially launched as an independent designer-maker weaving brand with the support of Prince's Trust and Virgin Start-Up Scheme. With their support I have invested in a brand new ﬂoor Dobby loom and new studio in East London. I strongly believe in making ethically conscious textiles. 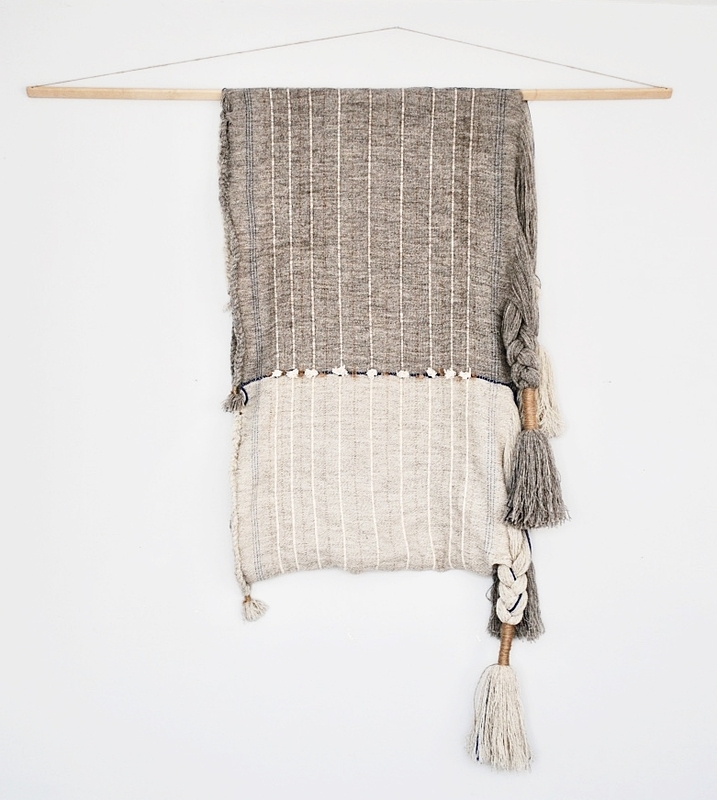 By adhering to a Zero Waste philosophy, I aspire to make hand-weaving an even more sustainable craft. I strive to decrease to the minimum yarn waste and unnecessary cuts, carbon footprints, the use of machinery, water and electric energy. I consider the environmental impact at every stage of the design and making process to the packaging. By emphasising on materials and texture, and removing any superfluous elements, my work pays close attention to usability and aiming at producing high-quality interior products designed to become timeless heirlooms. In recognition of the support of The Princes Trust and Virgin Virgin Start-Up Scheme I am offering my friends & followers a 35% discount ON ALL ORDERS including existing products & commissions for the whole month of November! Taking inspiration from the colours of the Cyclades Islands in an endless childhood summer, the Phaedra V2 Throw twists natural shades of white, grey and black simplicity with an Aegean Blue hint in a classic bold twill pattern. 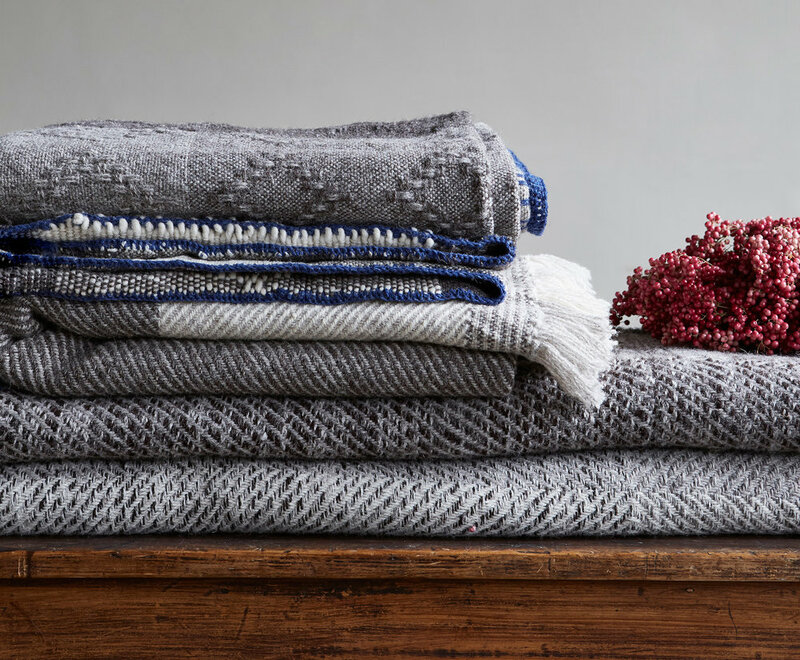 This large hand-woven throw with a summer-in-the-inside, zero waste design combines all pure new natural undyed British wool virtues and high production principles with a discreet Aegean blue hand-crochet finishing stitch on both edges that catches the eye - a reflection of our most precious summer memories during long, gloomy, dark winters. 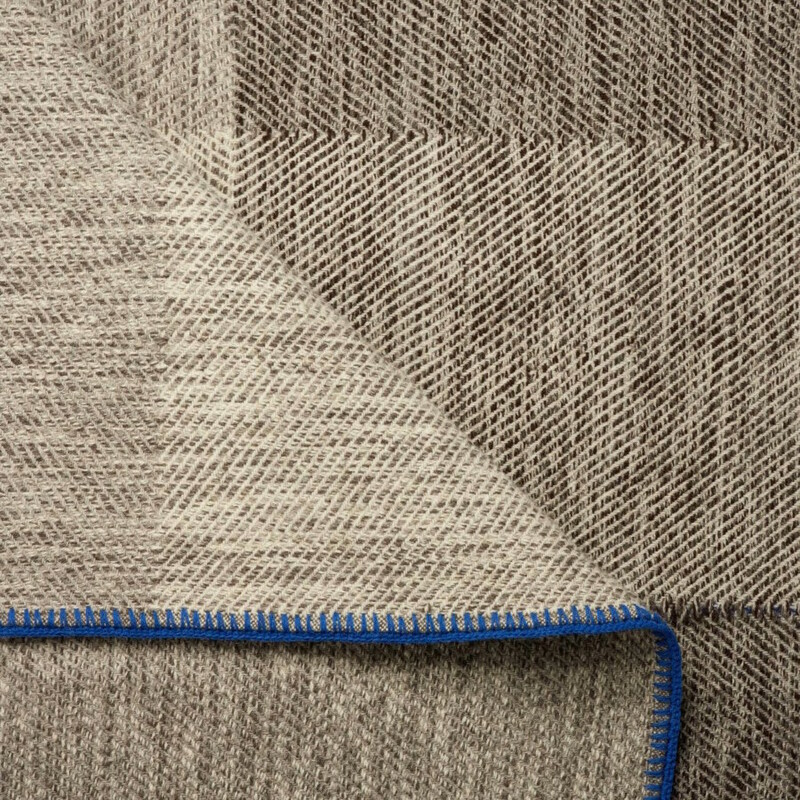 For the first time MARIA SIGMA | WOVEN TEXTILES is exhibiting at the London Craft Week. 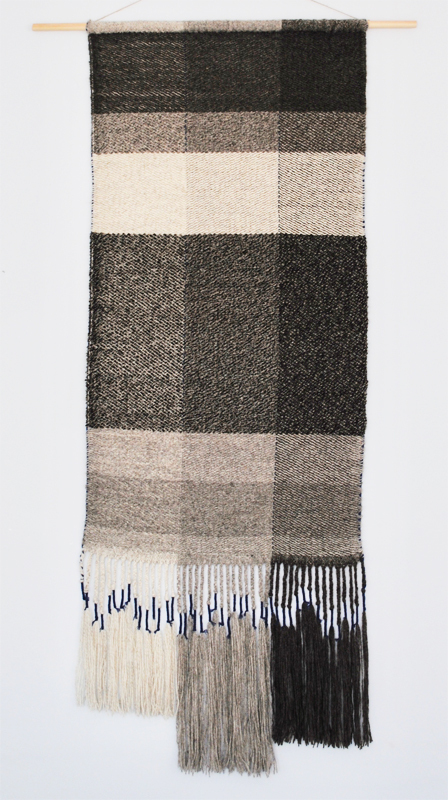 Over the weekend of May 5th -7th Maria Sigma | Woven Textiles will exhibita selection of her hand-woven work and for the first time the brand new Pheadra V2 Throw as part of London Craft Week at Peckham Craft Weekend. Showcasing the best of contemporary craft, celebrating tradition and innovation whilst also discussing current themes and issues surrounding craft today. Crafts people's work will be displayed in modern still lifes, exploring the theme of Instagram incarnate and encouraging discussion and interaction. On Friday the 5th of May there will be a showcase of modern craft including; textile artists, quilt makers and ceramicists. There will be a shop area and drinks! For more information and to read the feature please click here.